3) You will be redirected to Facebook and if you are not logged in then will be prompted to do so. Once logged in, follow the prompts by clicking the Continue button. 4) Facebook will then ask you to authorize our plugin to “manage your Pages”. Click OK. Important: This does not allow our plugin to manage your page settings, edit, post to, or do anything else to your Facebook page. It simply allows the plugin to retrieve a “read-only” Access Token for your page which allows it to retrieve posts or other content you wish to display. Note: If you plan to display feeds from more than one Facebook page, or use the plugin on other websites, then it is not advised that you use the “Chose what you allow” option, as doing so will prevent the plugin from being able to retrieve a token for other Facebook pages you manage either now or in the future. 5) A list of Facebook pages which you are an admin of will be displayed. Click on any of the pages to retrieve an Access Token. Note: You do not need to select the Facebook page that you want to display posts from. An Access Token from any Facebook page will work to display posts from any other Facebook page. 6) Scroll to the bottom of the settings page and click Save Changes & Clear Cache. 7) To display your feed simply add the [custom-facebook-feed] shortcode to any page, post or widget, as shown below. 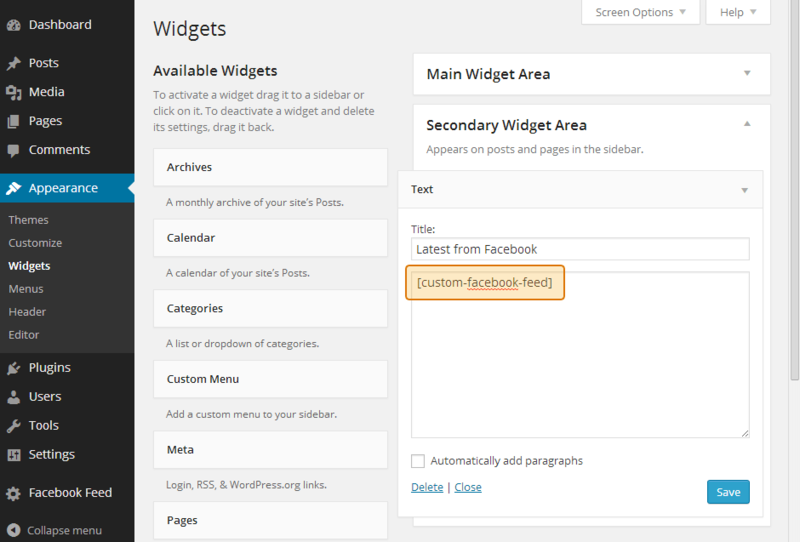 8) You can display multiple Facebook feeds on one page and specify options within the shortcode. Click here for a full list of shortcode options. 9) Navigate to the ‘Customize’ page to customize your feed. If you have any issues setting up or using the plugin then check out our support section for solutions to common problems. If you need help beyond that, then you can also open a support ticket either here on our website, or on WordPress.org.